For the first time in quite awhile, I had a class here at the studio. Nine of the fine members of Florida's Golden Palette were here for the better part of a Saturday for their monthly meeting and to paint a design that I had prepared for them. 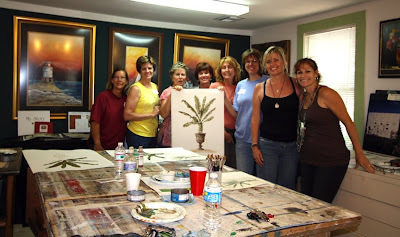 The group is our local chapter of IDAL, International Decorative Artisans League. 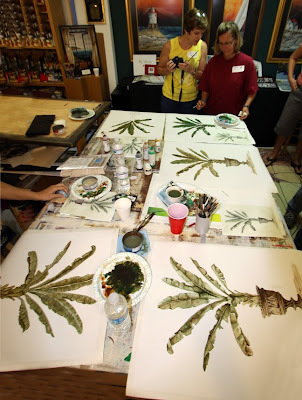 We all had a great time, or so it seemed, had probably way too many snacks available, thanks to my wife, Illene, and everyone did an amazing job on their paintings, especially given the time constraint and the fact that they all had to stand while painting (poor babies....,sigh> ;-)). I don't usually keep nine chairs in the studio.....I will next time though. The images they painted were based on a small painting I did a long time ago....sort of based partly on a banana tree from a Zuber wall covering design and an urn image I foun...probably in a Dover book. I basically 'erased' all the color from a digitised version of the original to end up with a line drawing, or cartoon, which I then printed at about 17" x 24" on base coated wall liner. As I mentioned, everyone did a great job, as you can see in the photos below. Thanks to all that took part. It was fun.